Future President Obama, current President Bush, and ex-Presidents Clinton, Bush Sr., and Carter met for lunch at the White House today to have their pictures taken and proclaim what precious few people in this super-polarized, "Bush is Hitler"/"Obama's a Communist" country believe: "Whether we're Democrat or Republican, we care deeply about this country." After that they broke for a top secret power lunch. 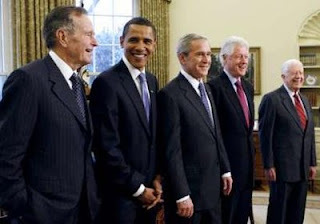 No official word on what they discussed but rumor has it that the veteran Presidents let Obama in on their little-known double identities as super-powered crime fighters.